It takes a lot of things to run a church. Beyond God’s presence you’ll have volunteers, books, resources, events, services, and more. 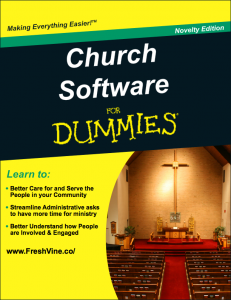 It is in the life of your church that software can be helpful. Let church software help you efficiently and effectively manage your resources and assets. There are many types of church software that you will need to cover the diverse and broad array of activities of church life. Below we’ll take a brief look at how church software can help in each of these areas, along with some suggestions. Of all the types of church software this is the most important. Membership software focuses on people – it’s also what we do at Fresh Vine. It helps you understand how they are involved and engaged. As a pastor or minister a lot of your work revolves around getting people connected. This is the goal of membership software. Get your free personal demo. We do Membership Software right. You might also see the phrase Church Management Software (or abbreviated as ChMS). This is a subset of membership software that supports the unique functions of your church. It makes it easy to check students into Sunday school. The membership software might also have some tools to assist further with your weekly services (tracking results, sermons, giving). Your membership software needs to be able to track all the primary ways people take part in your community. Below are some of the normal ways people take part. People attend services, make gifts, give online, join and attend a small group, and read your email newsletter. They may also attend Sunday school, volunteer on a team, serve on a board, be an elder, and more. Putting it all together gives you powerful profiles, data, and reports for your Church. The goal is to have one tool to understand your most important resource, your people. At Fresh Vine our first 100 customers were churches, and we love the impact they make as they partner with God. We’re proud of what we’ve built to serve you. Fill out the contact form and we’ll give you a personal demo of our software. The rest of the church software below helps in specific ways on focused tasks. Once you have a strong membership software in place look for tools that will help your community in other ways. These eight categories are used by most churches in one way or another. You might as well get some church software to make it a better experience. Pastors collect books like squirrels bury nuts. These books are a tremendous resource for their work of teaching and preaching. Many of the books are reference and scholastic in nature. Bible software allows you to put nearly all these resources on your computer or mobile device. Video projectors are IMAX compared to transparencies. Projectors are powerful for teaching and communicating. Good presentation software can elevate this even further. You can add dynamic backgrounds, a lyric libraries, and even the ability to control the presentation from your phone. No-one wants to miss out because they didn’t know. Sending email is a must, everyone has it, and they check it. Have software that lets you theme, add images, and track results. You may also want to manage social messages, sms texts, letters, or make phone calls. Use the methods your people want, and find tools to help. Parts of this may be in your member software, or an add on. The internet changed the way we collaborate and work together. Now you can be together regardless of place. Using tools for real-time document sharing, video conferencing, and group chatting. It allows you to provide flexibility to staff, and better use volunteers. Your stay at home parents can help while their children sleep. It can also let pastors across the city plan an outreach together. It takes gifts, skills, and commitment from a lot of people to make your services happen every week. Some of the most visible of which are the musicians leading worship. Church software helps coordinate your worship team, music, slides, and volunteers. Some of these areas are a part of your membership software. Often the needs of your musicians are unique and distinct enough to need their own software. Events play a large role in church life. Everything from the summer BBQ, youth lock-ins, concerts, conferences, and retreats. Depending on the event you need different tools. It could be as simple as online registration, or more complex scheduling and ticketing. The more simple functions may be a part of your membership software. Depending on how discoverable you want your event, you may still want to use a third party service. Being confident in the financial state and health of your church is critical. Having accounting software to understand your general ledger, receivables, payables, and other assets. Your Membership software can track your contributions and provided the needed contribution statements. We strong recommend getting a payroll service as well. Ensure that the vendor supports a ministers salary capabilities (housing and dual tax status). If you’re fortunate enough to own a building, it is more then likely your largest single asset. You need a tool to help use it well, and keep costs down. Facility software can help with room reservation and scheduling, equipment reservation, and event registration. This software can also interface with your HVAC and lighting to help you save money. 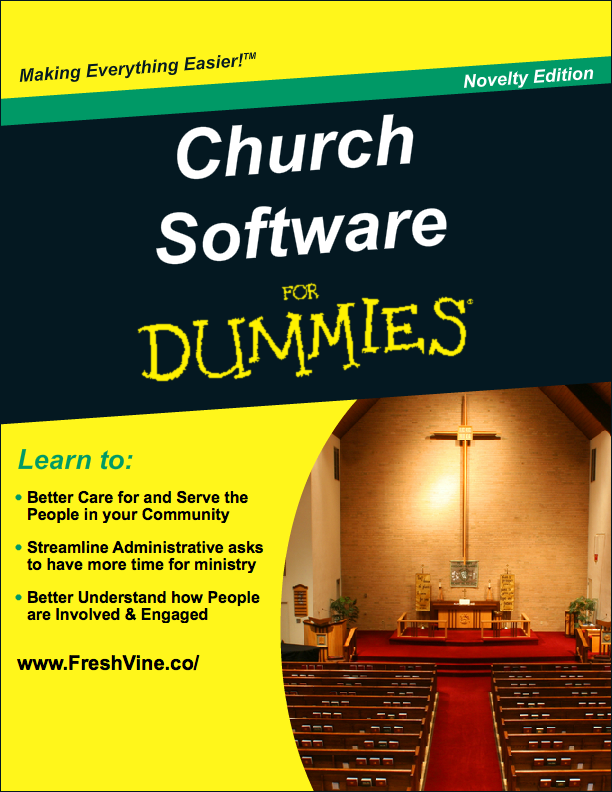 While not the most important church software, it will save you headaches, time, and money. We love helping churches! From the beginning we have proudly helped local churches like yours use our church software. Our passion is to help you get your church rooted and growing. Lets help you find the right church software tools to get where God is taking you.